Dutching Calculator | Dutch Betting Australia Guide 2019! If you’re unsure how we use the dutching calculator to make profits each week you should take a look at the article below. This explains how we use it to arbitrage bet with Australian bookmakers. After completing the matched betting Australia guide and make a tidy profit, to continue making money each week I’d recommend you give Bonusbank a try. You can get a free 7-day trial here by using the code ALERTSOZ to check out their premium matched betting service. Their daily promotion plays made over $12,000 last year. This post explains how to use the dutching Calculator above to make profits matched betting each week. Dutch betting or dutching is a technique where we choose a selection on one bookmaker and then choose an opposite selection on a different bookmaker. It’s similar to the simple back and lay strategy we use in the regular no risk matched betting Australia guide. The difference is that we don’t use a betting exchange to lay our opposing bets to hedge against the other outcomes, we use other bookmakers, there are several benefits to this. This can be a great strategy if several bookmakers are offering promotions on the same game. We can place all our opposing bets with each bookmaker to balance the bet out, we will still make a qualifier loss in most cases. However it will be just one small qualifier loss to have a chance of hitting it big with a lot more bonus bet profit. 1) If you have a turnover requirement you can add this bookmaker into your dutch bet. This means you are getting extra value out of your qualifier losses. 2) It can also be used to mug bet, if you use a bookmaker without a promo to balance the other side of a bet instead of laying it off on Betfair the you will make the same qualifier loss in most cases but the bookmaker will see we are not only betting on promo offers and this can keep your account alive longer. 3) One qualifier loss for the chance to hit a huge amount of bonuses across lots of bookmakers. How to use the dutching calculator to make money online from Australia! I will keep it straightforward and show you the easiest and most common dutching promo we play. I post often them in the daily offers section on this site and to the Facebook group. This means that if we back one team with Sportsbet and the other with Bet365 using the head to head dutching calculator we will make a small qualifier loss but if either team lead by 24 in the AFL or 12 in NRL and go on to lose we will get paid out twice and make a huge amount of profit for very little risk. These simple head to head bets are perfect for the dutching calculator. However as we like to play as many promos as possible that are likely to convert into profit we will want to add more bookmaker promotions into the same bet, some examples of how we do this are below. They pick the best promos most likely to make us money and combine them daily like in the image below. We then use the dutching calculator to see how much to back on each bookmaker to make the most profit. As you can see at the price they play the bet below. We lose $20 in a qualifier amount if Essendon win but if that happens you will also make $32.5 with the Crownbet promo, and if Collingwood win you lose $7.2 in a qualifier loss but will very likely make a lot of money from the bonus offers, simply add more bookmakers in like the example below. This is how we clear $1000 profit each month through using bonusbank. 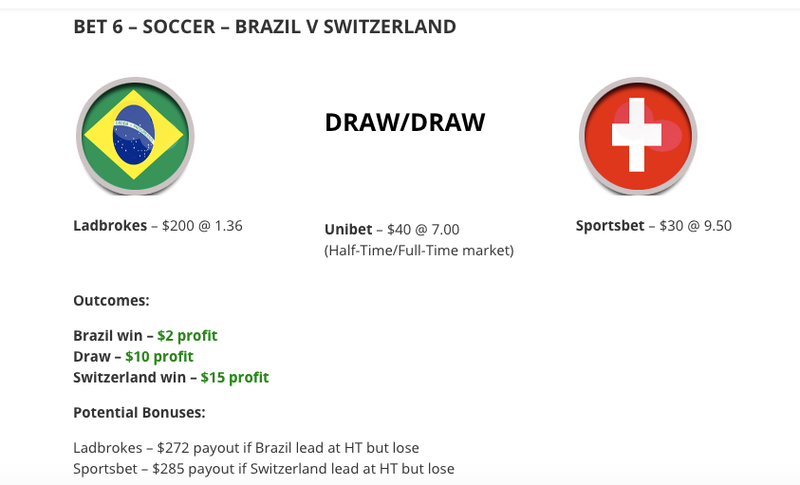 Another very profitable example of where you can use the dutching calculator is with soccer games like the during the world cup. If you want to dutch bet soccer games you will need to place 3 bets are unlike a head to head AFL/NRL bet you will have 3 outcomes to bet on, Team A win, Draw and Team B win. Below is how I am using it during the world cup offers that 2 bookmakers have, if your team leads at half time they pay you as a winner early, if they then go on to draw or lose you will get paid out again on the same game, so you will make a huge profit. As you can see in the Bonusbank example below no matter what happens we are guaranteed a profit by simply playing the 3 bookmakers against each other, and if one of the bonuses activate we are in to win a huge amount more, over $300 risk free! This is why it is very important once you get into the more advanced stages of matched betting and past the initial sign up offers to have this technique and the dutching calculator in your arsenal.